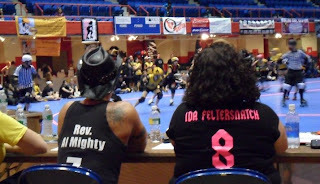 Hellions of Troy Roller Derby: Guest post by Miss Ida: What is AFTDA? Guest post by Miss Ida: What is AFTDA? Miss Ida with CDTA skater Up End Atom. It really goes on and on. Sometimes it stands for a league's name like "HoT RD" is the Hellions of Troy Roller Derby. Sometimes it's a team like CDTA is the Capital District Trauma Authority (who skates under the league of Capital District Men's Roller Derby - CDMRD). It could also be a governing body like the WFTDA is the Women's Flat track Derby Association and MRDA is the Men's Roller Derby Association. Or it could be a certain type of official like a NSO is a Non Skating Official, those amazing people holding up the white boards and writing down important information on a clipboard. It could even be a specific move or status, LJ is Lead Jammer and JTO is Jammer Take Out, something most blockers strive for! One acronym you might not be familiar with the AFTDA. Now, it looks pretty close to WFTDA and there is a reason for that. AFTDA stands for the Association of Flat Track Derby Announcers. Sadly not a lot of skaters even know such a thing exists...but we are hoping to change this! If you have ever been to a flat track roller derby bout, watched one on TV or even caught one of the multiple on-line streams then chances are you've heard exceptional play by play, witty banter and a detailed explanation of the rules and strategy employed by the skaters on the track. If this is the case then you've heard an AFTDA Member hard at work. 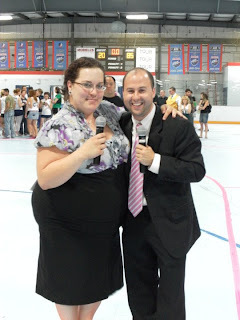 We are the sports broadcasters for the fastest growing sport in the world, Flat Track Roller Derby! The members of the AFTDA strive to improve their knowledge of an ever changing game, increase their level of professionalism and ensure a good time is had by all. The AFTDA members are lovers of Roller Derby and their enthusiasm shines through in the voices you hear while at most sanctioned roller derby bouts. Certification tests have been developed to ensure that each announcer has a deep understanding of the rules, methods and hand signals employed during a roller derby bout. While they make it seem easy while on the mic, these announcers have dedicated their time and their efforts on bringing the highest level of play by play, sponsor marketing, crowd education and fan enjoyment possible to each and every bout. Wait. Did that blurb up there say something about a test and rules? Oh yes! AFTDA members are the best of the best! We aren't just on the mic talking about pretty girls skating in circles. We take this gig seriously. AFTDA members are expected to know the most up to date WFTDA rule set. All 43 pages, including hand signals. It's a lot to know but if the announcer doesn't know it how are they going to explain it to you? The certification test is given several times a year and mostly at large venue events, like the Big 5 Tournaments and the East Coast Derby Extravaganza put on bu the Philly Roller Girls every Summer (or as I like to call it: Roller Derby Summer Camp) ECDX is where I passed my certification test with a 98! I was pretty excited to say the least! The AFTDA also has a Code of Conduct. You might be wondering why announcers would need a Code of Conduct for....Well, say you are a jammer and just reentered the track from the penalty box. Not one blocker has turned around to see you and all of a sudden the announcer calls out "Jammy McJammer is out of the box and about to pass through the pack!" Suddenly everyone turns around and sees her! D'oh! Not ok. This is a serious NO-NO in announcing and, conveniently enough, is addressed in the COC (another acronym). Derby announcing isn't like major league sports. Derby generally takes place in smaller venues and spectators and skaters alike can hear our announcing. The announcer’s job is to explain what just happened, not predict the future. Good announcing should have nothing but a positive impact on the bout. Educate and entertain, that’s my motto. Bad announcing can get you punched at the after party! The AFTDA has a Board of Directors (BOD, I told you there are tons of acronyms). the BOD is made up of our Regional Representatives including the Eastern Rep, Boston Derby Dames very own Pelvis Costello. I have known Pelvis for quite some time now, and I have to say he is one of my AFTDA derby announcing heroes. He is very witty and I dare say the master of pop culture references. He is also very knowledgeable about the sport. He was so very understanding and patient with me as I learned the ropes at my first WFTDA Regionals last year. 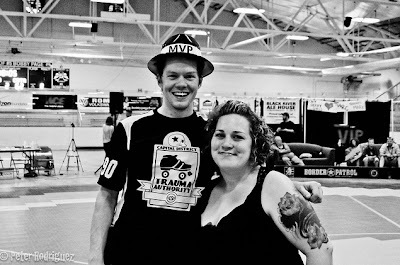 Working with one of her annoucer idols, Mr.
Jake Steel of the LIRR at ESS 2010. Another one of my AFTDA announcing heroes is Long Island's Jake Steel. He has been with LIRR (Last one, I promise.) since they first started up. I am proud to say the majority of my clever derby lines come from this man. He single handedly wrangles all of the announcing for the Empire Skate Showdown, New York’s roller derby tournament. That’s a lot of work and don't think we don't appreciate you for it Mr. Steel! I have a very long list of announcing heroes so I won't subject you to all of them. But please keep in mind the next time you are at a bout and there is a good announcer who is speaking clearly, explaining the rules, is witty and doesn’t piss off the skaters. That might not be your average run of the mill announcer calling that play by play. You might be in the presence of an AFTDA certified announcer! I posted an interview with Reverend Al about AFTDA and how difficult it is to be neutral on the mic. Besides my general stage fright, I think not telling the skaters whats going on would be the hardest part, that and thinking of an announcer name. I think Ida's is one of the best actually. And she writes too. Is there anything you can't do, Miss Ida? Coming to our bout tomorrow? Say so on Facebook.